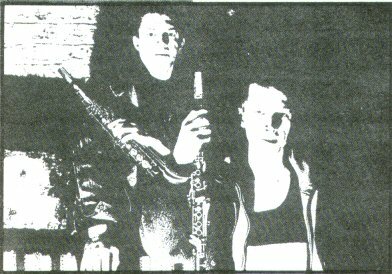 Sounds, April 13th 1985, "Tongue Twisters"
Darkened corridors, a squealing cat, tribal rhythms. Ah! These are a few of my favourite things. Biting Tongues explain how to turn celluloid into vinyl. THE AWFUL truth was out from the start. Biting Tongues got together to do the soundtrack of a film. LIVE! How about that then, Ennio Morricone? Actually, it was a little less auspicious than “The Good The Bad And The Ugly”. But it worked, and this loose limbed Manchester collection surfaced with a nucleus of five and a "very fresh" debut platter on Situation 2. 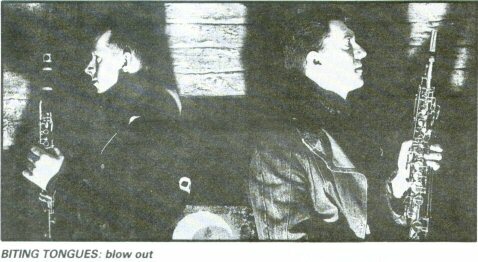 "Then we did a cassette which sold more than the album. That was recorded live but not even mixed, and it wasn't until the second vinyl album that we went into a 24 track. " Even that was only for part of the project. The Tongues have always been heavily restricted when it comes to cash money. The album was on the less solid Paragon label which disappeared, with its wallet, before things could be amicably completed. Noone knows how many were sold or pressed. The album was still greeted with high eyebrows and a scurry of activity, especially from the group. A decent sleeve this time, gigs, the band involved in phoning would-be interested parties. And then ... nothing. Biting Tongues splintered. The next project was Feverhouse, a film which was released in video format about six months back - partially involving Howard Walmsley of the Tongues – through Factory's Ikon label. A stark, brutal, black and white flick filled with shadowy imagery, it's real edge of the seat material racked with tension. The soundtrack was by the latest Tongues line-up - time had, of course, changed their appearance somewhat - and to further enhance the work, Factory decided to release an album of the associated noise. The Tongues went one better and reworked the soundtrack wares to make the whole thing a tastier delight. "A lot of that album was done going round with a Walkman and collecting lots of good sounds, using it like a camera. A lot of the rhythms were done outside of the studio. We took the stuff into a simple eight-track and worked it up into what we wanted. " The sounds are very crisp. It's an engineer's nightmare being faced with something like that, but the Tongues avoided the temptations of cleaning up the sound afterwards and the results are ultimately more satisfying. "The good thing about 'Feverhouse' was that you could work on one track and layer things over it and go from one thing to another really easily. What we did was work with tunes, rhythms and ideas that we wanted. When we got into the studio we were able to work on thorn and make them into something else. " Already there pre plans tot' new work with films. There's a new BT line-up for five appearances, which will be more frequent now that Factory have finally managed to oust the LP from the pressing plant. The assembled duo chat continually about Jazz and the snobbery involved. Parallels, maybe, to the way that they work? Now, that's a difficult one. If you really want to find out about Biting Tongues as well as sample some very different approaches to modern music then buy 'Feverhouse', Slip it on the stereo and let those everyday sounds turn into a musical nightmare.